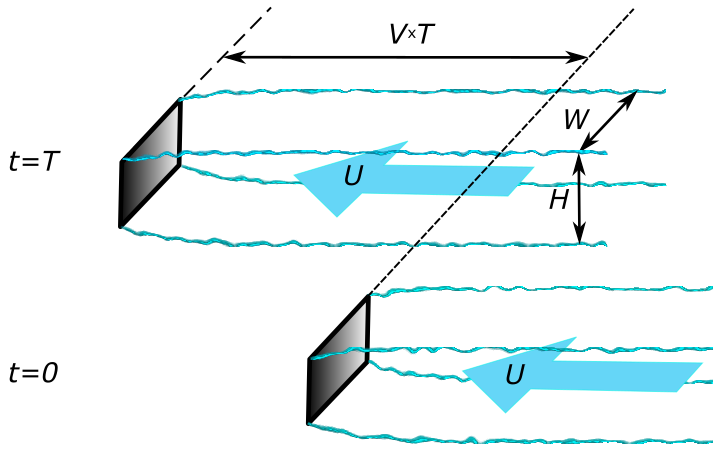 The width of the wake and the velocity in it are closely related to the drag of the mirror. In order to understand this it is convenient to change the frame of reference. Namely, instead of looking from the window of a moving car, we will now assume that we are standing still, while the car is passing by. In this frame of reference the air far ahead of the car is not moving. When the car is passing by it is leaving behind a wake, in which the air is moving. If, for simplicity, we will ignore the vertical component of the velocity, and will consider only the flow past the mirror, ignoring the car (well, does it look like not noticing an elephant in a china shop? No, not really), then what is happening can be illustrated in Fig.L6. Note how T cancels out. This is correct, as the drag force should not depend on T.